These beauties are fun and easy to make in a variety of colors. 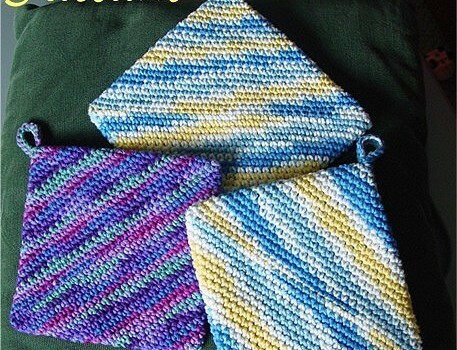 Origami Hot Pad pattern by Ed Barrall II is suitable for playing with different yarn and hook combos. Make a bunch of them using solid colors or mixing up with scraps, they look great in any combination. 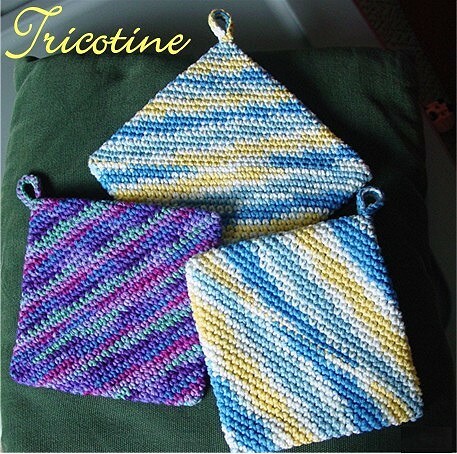 This speedy crochet hot pad makes a nice and much appreciated gift. Materials for a 7 X 7 inch pad: One ball of Sugar and Cream worsted weight cotton (about 120 yards). Hook: Size H ( 5 mm) gives a medium density pad. A smaller hook (G) will give a higher density pad and take more yarn. A larger hook (I) will give a more open pad. Thanks to Ed Barrall II for the article inspiration and featured image. Some of mine from this pattern…..
My momma used to make these. I’ve made a lot of these and used worsted weight yarn too. I have been looking for this pattern. I use cotton/worsted or all cotton (Hobby Lobby I Love Cotton?? I use to make these. Just love um. I make these all the time for friends and family. They do up quick and are the best potholders. I love this pattern! love the double thickness and so easy to make. Love this pot holder. Have made several. So easy to make. i have been making these, fun , quick. You said free pattern….. HOW DO I GET THE PATTERN,PLEASE….. The only thing wrong with this pattern is when the two sides meet and you are ready to find mosh that off, you need to make a loop for hanging so sl st in last st, chain 5, sl st in same stitch you did before then leave a length to whip stitch the two sides together. I’m pretty sure that’s not the original source for the pattern, seeing as how grandma’s have been making them for decades..this is just one of those things that have been around forever.